In reading the following story about Syria and Iraq it is worth noting that Syrian officials here have been saying that Syria can help the US depart Iraq “honorably.” The implication is that the US would be embarrassed by an outbreak of violence in Iraq following US departure, something Syria can help to stop. The Iraqi government expects al-Qa’ida and Baathist insurgent groups to launch a wave of attacks so they can take credit for compelling the US military to leave Iraqi cities by 30 June, according to a senior Iraqi minister. An American military team was dispatched from Baghdad to Damascus at the weekend to demand that Syria help choke off a guerrilla offensive by imposing greater control over its border with Iraq, Iraqi Foreign Minister Hoshyar Zebari revealed in an interview with The Independent. “I think the American rapprochement with the Syrians will be judged more by their co-operation, not in Lebanon, but in Iraq,” said Mr Zebari. “This is a good moment for them to come clean.” Although Syria has been more co-operative with Iraq than in the past, guerrilla fighters are still crossing over the border, he added…. “The purpose of the US military team going to Damascus is to urge Syria to do more to prevent foreign fighters from coming here,” said Mr Zebari. “According to our intelligence analysis al-Qa’ida, the Baathists and all armed groups will escalate the violence just to prove that they have won a victory. “Without any evidence, many U.S. politicians and “Iran experts” have dismissed Iranian President Mahmoud Ahmadinejad’s reelection Friday, with 62.6 percent of the vote, as fraud. They ignore the fact that Ahmadinejad’s 62.6 percent of the vote in this year’s election is essentially the same as the 61.69 percent he received in the final count of the 2005 presidential election, when he trounced former President Ali Akbar Hashemi Rafsanjani. The shock of the “Iran experts” over Friday’s results is entirely self-generated, based on their preferred assumptions and wishful thinking…. EU ministers said in a statement they “welcomed the initial step” of Netanyahu’s speech, but added it was not enough and that Israel had to unequivocally state its support for the two-state solution. The EU “remains deeply concerned by settlement activities” and urged the Israeli government to “immediately end settlement activities, including in East Jerusalem and including natural growth,” the statement said, reiterating the position that settlements are illegal according to international law and are an obstacle to peace. وزير المالية إن التحصيل الضريبي ارتفع في العام الماضي ليصل إلى 360 مليار ليرة سورية مقابل 6ر301 مليار ليرة سورية عام 2007 موضحا أن هذه الزيادة جاءت من خلال مكافحة التهرب الضريبي ولاسيما أن وزارة المالية لم تفرض خلال العام الماضي ضرائب أو رسوما جديدة. وبين الوزير الحسين أن مساهمة الضرائب والرسوم تشكل حوالي 60 بالمئة من إيرادات الموازنة حيث حلت بذلك مكان النفط الذي كان يشكل حوالي 70 بالمئة من هذه الإيرادات مؤكدا أن وزارة المالية ليست بصدد فرض أي ضرائب أو رسوم جديدة وإنما تركز جهودها على زيادة الإيرادات الضريبية من خلال مكافحة التهرب الضريبي. ….Syria’s problematic finances and its potential confrontations with the IAEA and the Hariri tribunal provide Washington with leverage that it can incorporate into its diplomacy with Syria to break the status quo. Exploiting pressure from the IAEA and the Hariri tribunal should be easy for Washington, since the pressure is coming from international institutions with established mandates. Utilizing U.S. economic leverage will be trickier, however. The United States has substantial “negative pressures” it can employ from the recently renewed Syrian Accountability and Lebanese Sovereignty Restoration Act (SALSA) and a series of executive and Treasury Department orders targeting Syrian individuals and banks. In terms of positive inducements or “rewards” in the event of peace, however, it is doubtful the United States can entice substantial foreign investment in Syria without addressing the country’s worsening corruption problems. On a political level, should Syria conclude a peace treaty with Israel and implement reforms that would facilitate large flows of FDI, the minority networks in the security services and the bureaucracy stand to lose the most. Given Iran and Hizballah’s close relationship with Syria’s security establishment, the discontent of these networks could be exploited by Tehran to derail implementation of a future peace. Damascus has thus far refused to address its support for terrorist organizations or domestic issues — most notably human rights — in its early dialogue with the Obama administration. No doubt terrorism will be on the agenda if the United States mediates Israeli-Syrian peace talks. But rather than dumping domestic issues — a common practice in the past — Washington should add rule of law to its list of priority issues for dialogue with Syria. “Egypt and Syria have upped their pressure on Hamas in recent days, in support of a reconciliation agreement with Fatah. The deal would include a multinational Arab force in the Gaza Strip that would operate in parallel to joint Fatah-Hamas security forces. An Egyptian source told Haaretz that the American administration is aware of the plan’s details and apparently special envoy George Mitchell has asked the Damascus government to use its influence over Hamas to push the plan and the Quartet conditions. The Americans promised the Syrians that if they take on a positive role in the Palestinian channel, the U.S. would act to resume negotiations in the Syrian track. The Hamas-Fatah reconciliation plan includes the creation of a joint dozen-member committee, to be under Palestinian Authority President Mahmoud Abbas’ indirect authority. The committee, only authorized to act in Gaza, would be in charge of post-Operation Cast Lead reconstruction, government reforms, and preparations for the January 2010 presidential and legislative council elections. All factions would undertake to honor the election results and allow the elected government to rule in both Gaza and the West Bank. Military forces from Egypt, the Emirates, Saudi Arabia, Morocco and other Arab countries would assist local forces in maintaining order until and throughout those elections. …. “The Obama administration’s pointman on Iran is moving from the State Department to the White House to better coordinate inter-agency policy on the Persian Gulf region, U.S. officials said Monday. Dennis Ross, who is in charge of formulating President Barack Obama’s outreach to Iran as special adviser for the Gulf and Southwest Asia, will take a similar position at the National Security Council, the officials said. The officials spoke on condition of anonymity because details of the switch have not yet been finalized. Insurance premiums reached SYP 3.1 billion in the first quarter of this year according to data from the Syrian Insurance Federation. Al-Ahliah Vegetables Oil Company saw its shares listed in the Damascus Securities exchange on June 15 after it received a formal approval from the board of the Syrian bourse. The number of tourists visiting Syria, in particular from Europe, has continued to increase in the first five months of this year, according to data from the Ministry of Tourism. A math whiz since childhood, it seemed a foregone conclusion that Rasha Al Dabbas, 15, would take up a career in engineering or medicine. So when she informed her parents of her dream to open branches of her own bank in different provinces of Syria after graduation, they were taken aback. Dalal Al Imadi, 15, has come up with a novel idea of creating a website on the internet to design advertisements for companies. “This is a very rare idea, giving companies an opportunity to promote their products on my website. There is no such website in Syria, yet,” she claims proudly. Turning away from the traditional and accepted career options of doctor, teacher or engineer, young women in Syria are setting out to storm the hitherto male bastion of the business world, be it in the banking sector, web-designing or as a private enterprise. According to the Central Bureau of Statistics (CBS), female participation in total labour force has increased from 12.4 per cent to 16.3 per cent between 1994 and 2006. Perhaps the greatest factor in Ahmadinejad’s favor is that Mousavi spoke for the better districts of Tehran — something akin to running a U.S. presidential election as a spokesman for Georgetown and the Lower East Side. Such a base will get you hammered, and Mousavi got hammered. Fraud or not, Ahmadinejad won and he won significantly. That he won is not the mystery; the mystery is why others thought he wouldn’t win. For a time on Friday, it seemed that Mousavi might be able to call for an uprising in Tehran. But the moment passed when Ahmadinejad’s security forces on motorcycles intervened. And that leaves the West with its worst-case scenario: a democratically elected anti-liberal…. The question now is what will happen next. Internally, we can expect Ahmadinejad to consolidate his position under the cover of anti-corruption. He wants to clean up the ayatollahs, many of whom are his enemies. He will need the support of Iranian Supreme Leader Ayatollah Ali Khamenei. This election has made Ahmadinejad a powerful president, perhaps the most powerful in Iran since the revolution. Ahmadinejad does not want to challenge Khamenei, and we suspect that Khamenei will not want to challenge Ahmadinejad. A forced marriage is emerging, one which may place many other religious leaders in a difficult position. German businesses have long complained about tough restrictions on trade with Iran, claiming that bans on certain exports only benefit their foreign competitors. Now a far-reaching court decision is posing a challenge to the government’s rigid policies. The tone of the letter to the German Foreign Ministry may have been polite, but the content was pointed. Over five pages, Martin Jäger, the chief lobbyist for carmaker Daimler, explained why Berlin’s export restrictions on trade with Iran place German industry at a serious disadvantage. A truck carries a Ghadr-1 missile during a military parade in Tehran: Berlin is worried that German vehicles could be used to launch Iranian rockets. US CONSUMERS ARE 4.5% OF WORLD POPULATION. THEY SPEND $10 TRILLION A YEAR….. CHINESE AND INDIAN CONSUMERS MAKE UP 40% OF THE WORL POPULATION THEY SPEND A COMBINED $2 TRILLION A YEAR IN OTHER WORDS, US CONSUMERS ARE 10% OF CHINA AND INDIA IN TERMS OF POPULATION BUT THEY SPEND 5 TIMES MORE GLOBAL RECESSION IS BASICALLY INEVITABLE IF THE US CONSUMERS ARE ON STRIKE. Do we have to see such an aweful picture? 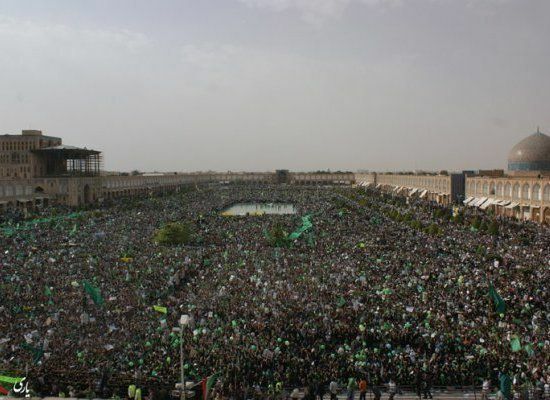 Responsible journalism: HuffPo currently uses a picture of Mousavi’s 06/11/09 pre-election rally in Isfahan with a caption that reads “Naghshe Jahan Square, Iran, June 16 2009”. After inspecting the car, the soldiers found a quantity of explosives that were placed inside the trunk. The army cordoned off the area immediately and arrested the driver, who was identified as Hassan Merhi. A military expert checked the car in the presence of the director of army intelligence in south Lebanon, Major General Ali Shahrour. The quantity of the explosives was estimated at half a kilogram of TNT. The photo is indeed…. dramatic. In this age of uninformed and uncritical journalism, how about some ‘deductive’ speculation? Rafsanjani wants to protect the considerable financial and political interests of his circle. Ahmadinejad represents a real threat to those interests. In addition, Rafsanjani is involved in a power struggle with Khamenei. So he wants to stop Ahmadinejad and weaken Khamenei. At the same time, he is not interested in rocking the boat too much, because that would also threaten his interests. There was a real risk of losing the election (and, in consequence, his interests) against the populist Ahmadinejad (once again, please note that I’m not saying that Ahmadinejad actually won). Therefore Mousavi came out incredibly early (when the polls had hardly closed) to declare himself the winner, in order to cast doubt on a possible electoral win by Ahmadinejad. This ‘gambit’ prompted the Iranian Interior Ministry to also come out incredibly early and present the first ‘results’, effectively lending credence to Mousavi’s claims and undermining the credibility of the elections, leading to widespread protests, a brutal crackdown by pro-government forces, provoking further protests, etc. Rafsanjani may want to force Khamenei to accept some form of compromise, a ‘unity government’ that reigns in Ahmadinejad. As a result, Khamenei’s position would also be considerably weakened. The question is if the elites will be able to get the genie of rebellion back into the bottle once their infighting is over. Will the (upper?) middle classes and genuine reformists be able to gain more freedoms and to preserve them once the battle is over? Or will they not only rock the boat, but turn it over (with Rafsanjani in it)? One can hope, but I’m afraid that the backlash could be brutal and bloody. One of the most important development in Syria , the Legal system might have started to declare it’s independence. A Syrian court issued on Wednesday a rare acquittal in a political case, finding dissident Walid al-Bunni not guilty of ‘weakening the morale of the nation’. Bunni is already serving a 2-1/2 year jail term for political crimes since he took part in a 2007 meeting that tried to revive a movement for democracy in Syria. He was indicted while in jail for having conversations with an imamate that constituted in the view of the attorney general “false statements that weaken national morale”. “In the name of the people of Syria the court rules against the prosecution and announces defendant Walid al-Bunni not guilty,” said Brigadier General Mohammad Abu Zaid, the military court judge. Bunni, whose mother died several weeks ago, did not react. The session was attended by diplomats of Western states including France, Spain, Sweden, Denmark and the United States, which has improved its ties with Damascus in recent months. Mohannad al-Hassani, Bunni’s lawyer, said the judge acquitted his client for lack of evidence after allowing the defence to present nine witnesses compared to one for the prosecution. Hassani said another court jailed last month Kurdish politician Mishaal al-Tammo for 3-1/2 years for weakening national morale without allowing Tammo’s lawyers to present a defence memo. Kamal al-Labwani, another dissident was sentenced last year to 2-1/2 years in prison on top of a 12-year term he was already serving on weakening national morale charges Hassani said were trumped up. “I wish all the courts on Syria would follow the lead of this tribunal, which did its duty and fairly applied the law,” Hassani said. Bunni, a 46- year physician, served a prison term from 2001 to 2006 for his role in what became known as the Damascus Spring, a brief period of openness following president Bashar al-Assad’s succession of his late father, Hafez al-Assad, in 2000. The Damascus Spring was crushed and Bashar kept intact the political system he inherited, including emergency law and the monopoly of the Baath party on power, but took several steps to liberalise the economy after decades of heavy nationalisation. Several of the Damascus Spring leaders, including Bunni and Riad Seif, who has prostate cancer, were imprisoned again in recent years. Appeals by Western leaders and politicians, such as French President Nicolas Sarkozy and U.S. Senator John Kerry, to Bashar to release them have failed. The Syrian leader has said that those in jail had violated the constitution and made it clear that his priority was to preserve what he described as national cohesion. There is a good chance that Khamenei is going to hang Ahmadinejad out to dry. Most suitable read for OTW. This should a favorite for Alex. He makes sense, it seems. We are our worse enemy. Read here what recent elections mean to a certain pariah regime. The last statement in the fact of the day (“GLOBAL RECESSION IS BASICALLY INEVITABLE IF THE US CONSUMERS ARE ON STRIKE”), while true, deserves some scrutiny. Its perhaps implicit message is that to alleviate recession the US consumers need to raise their current level of consumption. Two clarifications are necessary: Which consumers do we have in mind? And what is it they should consume? The reason is manifold: First, the US consumers are already gluttoned with wasteful, over-consumption of things they don’t need, as partly reflected in the lopsided percentages mentioned in the quote. Bigger houses, bigger cars, bigger meals, malls, TVs, waistlines, more toys, are quick indicators. Second, increasing US consumption means increasing the already unsustainable pollution, over-extraction of resources, environmental and eco-destruction. Third, the savings of US consumers is around $0; increasing consumption by anyone beyond the opulent minority, means increasing the debt on the already over-indebted population. But the fact that the more wasteful and indebted one is the better “the economy”, says something about distorted priorities in capitalism. The environmental destruction and wastefulness that characterize capitalism (“capitalism is efficient”, rumors have it) is potentially a threat to the survival of life on earth. Having said that, not all types of consumption are bad of course. Consumption, or perhaps spending, in useful and necessary avenues for the good of people and society should be very welcome. So, we don’t need, for example, people to buy more cars to help “the economy”, as the individualist, short-term-thinking capitalist drive would advise. We do need, on the other hand, to build an efficient transportation system. Individuals under capitalism won’t do that; societies collectively can. Infrastructure, education, healthcare could also use some “consumption”. The population is already burdened and indebted trying to pay for these. Where to get funding for these? We have a population majority with zeros or negative savings, and a minority with astronomical amount of wealth totaling trillions. The obvious source of money, to help make capitalism less wasteful and more efficient –certainly more humane– is to tax these royalty. In other words, “the economy” should be re-defined to have the goal of satisfying people real long-term needs, not their short-term wants, one that is sustainable and is not a danger to the survival of current and future generations. Now all of this might not necessarily be good for “the economy” — stock prices and Wall Street– but it is good for the real economy of human beings, communities and societies. If anything, the recent upheaval of the markets, the financial instruments that were to efficiently allocate capital but became in reality tools to help the wealthy extract yet more out of the real economy, and the misery and instability these have engendered across the planet, are yet more indicators of how urgent the need is to get the economy out of the hands of the wealthy, to re-train the selfish consumer to become a caring citizen, and to align our thinking with the priorities of human beings and societies rather than the priorities of greed and consumption. What do consumers spend this amount on? $4.7 trillion is spent on services. The $10 trillion that I cited earlier is nominal spending (ie: without adjusting for inflation). Buying houses by the way is not consumption. It is counted as residential “investment” and is $294 billion a year. Without US consumption, Asian exports in particular will suffer greatly. The US government already spends and invests close to $2 trillion in the economy (18%). While the US consumer is indeed indebted, so is the US Government. You seem to have very little trust in the individual to make rational decisions about how to spend and on what. Instead, you want a government planner to make those decisions. Who do you want in charge of making this decision for 350 million and how they spend their money? Central planning has been a disaster wherever it has been tried. The free market and capitalism has created more wealth than any other system known to mankind. It of course has its weaknesses . As for taxation, the top federal tax bracket is now at 39%. Add state and local taxes, some of us are asked to pay just over 50% of our gross income. Is this not enough? I work from January 1 till july for the government so that it spends two trillion. Do u think that this is not enough? Should I extend that to September perhaps? It’s been a while since we debated economics. Hope all is well with you. Let me address the points you made. First, I don’t doubt your numbers; as I mentioned, (I used the words “while true”) consuming more does help the economy. But that is beside the point I was making, namely that the more wasteful one is, consuming more things s/he doesn’t need, the better the economy, and that American consumers consume more than they need. You seem to have very little trust in the individual to make rational decisions about how to spend and on what. It is not a matter of whether or not I trust the individual; it’s a matter first, of how much good information the individual is exposed to under a media dominated by concentrated wealth and power, to permit rational consumer behavior. It is also a matter of how the behavior and priorities of individuals or companies, change under capitalism. Thirdly, the decision to consume something should not be limited to the consumer and producer *when* the consumption of the product has an affect on society at large, like in the case of pollution. Regarding the first point, the advertisement and PR industry spends $1-$2 TRILLION dollars to shape the behavior of consumers (using the public airwaves), to deceive people to buy things they don’t need, to avoid mentioning how the consumption of their product and over-consumption in general harms people or environment; to basically ensure individuals act irrationally and selfishly, without thinking beyond satisfying some created, short-term want. The “rational” choice under capitalism offered is Coke versus Pepsi, not that such consumption is harmful and wasteful in the first place. Furthermore, the behavior of people and economic actors under capitalism is pushed more in the selfish direction, at the expense of altruistic and cooperative tendencies. The more generous you are, the more you will be taken advantage of under a selfish, competitive environment animated by greed. Say, for example, Jane has a little company and would like to be human rights-conscious in its operations, i.e., is willing to sacrifice some of its profits doing so. Jane will likely get driven out-of-business by another company that made more money by not caring about human rights. The incentive is to act less caring for others, and be greedy, or lose the competition. When a company hires a CEO it hopes he will raise the bottom line, not that he will be caring about society and employees. Nice guys finish last under capitalism. To say capitalism has weaknesses is an understatement. Be it the profound instability of the system, like the “subprime” collapse of 2008, the obscene inequality, the environmental destruction, over extraction of resources, atomization of society and community, undermining of solidarity in favor of selfish, greedy behavior. Yes capitalism has generated a lot of wealth, but at a grave and unsustainable cost, including generating a lot of deep poverty where a 1/3 of the world population living on less than $2/day, 100s of millions of slaves in “factories” making the clothes and toys we wear in the first world. Besides, what good is it when the great wealth generated by capitalism is increasingly falling in fewer and fewer hands? Inequality is extremely harmful for a society regardless of how rich it is. Instead, you want a government planner to make those decisions. Some decisions, like regulations, have to be made by government, especially big ones that affect, benefit or harm, others and society. Sure, choices one makes that affect only that person, can be made by that person alone. Besides, this alien, scary-sounding entity called “the government” maligned (not totally without good reason, like in unjustly limiting freedom) especially after the advent of Reaganism, is potentially *us*. The more democratic, transparent, and honoring of freedom, the more it is “we the people”. Big decisions, like building a transportation system, efficient and necessary for reducing waste and saving the environment, requires government -– individuals acting collectively — not people making choices individually. The smaller the project and the less people it affects, the less government is needed, more like local communities, can decide. Under capitalism, big project get built only if there’s big money involved, even if it’s extremely beneficial for society. Building a public transportation system, for example, will happen under capitalism only if the rich want to use it, which means it will not get built. Capitalism means one-dollar one-vote, not one-person one-vote. Finally, those who are affected by a project should get to voice their opinion to the degree they are affected. While driving an SUV, flying a private jet or owning a yacht, is an individual choice, it has an affect on everyone, with its pollution. But society is not given a choice to curb that behavior under real capitalism. Nor can you expect people, in an environment of greed and competition, to individually save the environment; one has to act collectively. The US consumer can’t create credit; the US government can. While in great debt, for example, it pumped trillions of dollars in order to .. save capitalism from its society-destroying tendencies (one of its “weaknesses”), to save the wealthy from the gambles they took while devising more ways extract yet more wealth from the real economy and in the process spreading the risk to society and the world at large. Privatizing profit and socializing loss is the motto of these barons. Saving them from collapse is called “saving the economy”, not what it really is: socialism for the rich. Meanwhile, the average person has to work according to the mandates of free market, as the oligarchs, bankers, AIGers, hedge fund managers, would advise while they fill their coffers with more of the public’s money and complain about high taxes. 50% is a relative, abstract number. The supposedly unjust, wealth limiting tax-rate you mention contradicts with the reality of the wealthy getting wealthier at a very accelerated rate. 50% might sound a lot, but the take home after that for the top .01% is still in the 10s of millions, and rising fast. About 50 years ago, for each $1 made by the bottom 90%, $162 was added to the wealth of the top .01%. Ten years ago the amount became $18,000. The “over-taxed” rich seem to be doing quite well, and increasingly so, as they devour more of society’s wealth. Not true. All companies employ central planning in their operations, for example. All communities have central planning in collectively funding and running of projects, road building/cleaning, public schools. All countries resorted to central planning in their development stage, in wiping illiteracy, building dams, roads, infrastructure, via state-owned land and industry. The advanced countries who preach free market still do in many ways, for example via subsidy to and protection for their industry. The US heavily subsidizes agriculture and high-tech (through the massive defense spending). Countries employed free market only *after* they developed, and selectively so. S. Korea was heavily centrally planned, for example under General Park, until it developed and stood on its feet; *then* it allowed some competition but with heavy restriction on capital movement, for example. On the other hand, empires, which used central planning for their development, plundered their subject countries by .. forcing the free market down their throat, ensuring the wipe-out of their industries in unequal competition, like GB did in India and the US trying to do in Iraq. In closing, at this stage I think a mixed economy might be best, with democratic oversight and public control of major decisions, environmental protection, owning the airwaves. Economic decisions that affect society must allow society a say in these decisions. It makes sense I think. Congress must fall again under public control and campaign “donations” from the oligarchs of industry, terminated. In other words, return power to society, i.e. make democracy meaningful, and let it decide and select on where to allow or curb the free market, and where to let government take control. A majority would choose single payer in health care, (but concentrated wealth says No!) a majority would probably choose free college education, a majority would choose a public transportation system, if people are allowed good information, not the distraction and misinformation generated by industry aimed at turning caring citizens to mindless consumers making irrational choices. as in every society there are people who can save and think for themselves and there are people who need to take their money and save for them so they will not be a liability in the future . It should never be tax based but buy in based with the same premium all over the country.